The most prestigious “Vishwakarma Award-2013” of Construction Industry Development Council (CIDC), under Category “Best Construction Projects”, is conferred upon “Suvarna Vidhana Soudha Legislative Assembly Building”, a magnificent monumental structure with ornamental stone work, constructed at Belgaum for Government of Karnataka by M/s B.G. SHIRKE CONSTRUCTION TECHNOLOGY PVT. LTD. (BGSCTPL), PUNE. Construction Industry Development Council (CIDC) is an Apex Organization, which is set up by the Planning Commission, Government of India, jointly with the Indian Construction Industry, to take up and promote activities for the development of the Indian Construction Industry. For the 5th CIDC Vishwakarma Award, CIDC has selected “Suvarna Vidhana Soudha Legislative Assembly Building” constructed at Belgaum by M/s B.G. SHIRKE CONSTRUCTION TECHNOLOGY PVT. 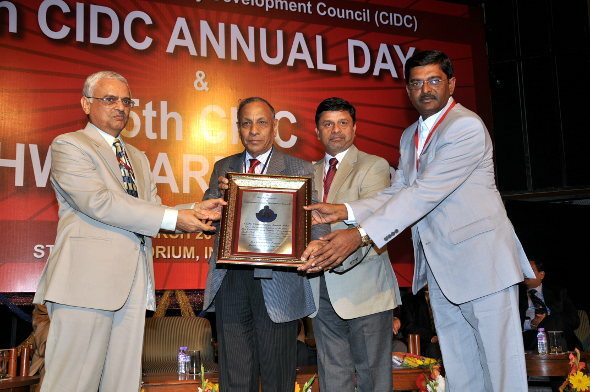 LTD., PUNE, under Code (F) – Best Construction Projects, amongst 140 companies contesting for this prestigious Award. Good one… Keep up BGSCTPL…! Congrats ! Nice to know that the great structure is in our own Belgaum !! Congratulations ! Wonderful work ! Indeed deserving. Gr8!, It proves that The Suvarna Vidhan Soudha is one of the Best Buildings in India.